No one gets a job as a retail cashier or shopping assistant to get rich. 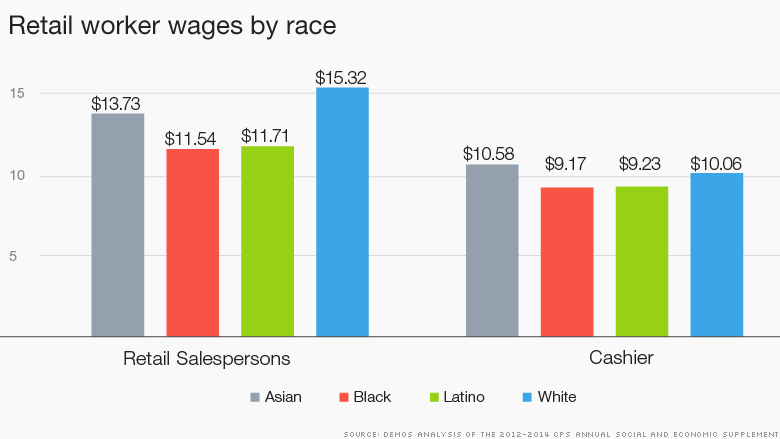 While the retail industry is known for its paltry pay across the board, skin color has an alarming influence on how many raises and promotions a worker receives. White retail workers earn $15.32 an hour, on average, while African American and Latino retail workers average less than $11.75, according to a recent analysis of government data by NAACP and Demos, a left-leaning think tank. The reason is simple: white workers are more likely to be promoted to manager roles, while minority workers are overrepresented among the lower-paid cashier positions. Paid less for the same job: Even among cashier jobs -- about as vanilla as you can get in the retail industry -- white cashiers are paid nearly $1 more an hour, on average. "Retail is where working class people are trying to work themselves into the middle class. A lot of very vulnerable workers allows an industry to develop practices that couldn't be done as well in another profession where workers have more strength and more options," said Dedrick Muhammad, senior director of the NAACP's economic department. Retail is the second largest employer of black workers in the United States. The study found that 17% of African American and 13% of Hispanic retail workers live below the poverty line despite being employed. Among white retail workers, only 9% are in poverty. Getting enough hours: One of the biggest issues for retail workers is getting enough hours. A 40-hour work week is just a fantasy for many. "You say 'I want full-time but I'll take part-time' when you need a job. And they never want to hire full time," said Sonsira Espinal, who is part-Venezuelan, part-Dominican. She worked at high-end fashion store Madewell for 15 months, until March 2014. "During training, they give your hours, and then it starts decreasing from there," the 25-year-old told CNNMoney. Madewell declined to comment for this story. Her experience isn't unique. Government statistics show an alarming trend: over 42% of blacks and Hispanics in the retail sector work part-time but want full-time work. They are known as "involuntary part-time workers." Only 29% of white retail workers have this problem. Some blame the new "just-in-time" technology. Stores use it to schedule workers and frequently end up canceling shifts an hour or two beforehand if store traffic drops. However, new technology can't shoulder all the blame for structural problems in the industry. A dead-end? Espinal heard managers talking about openings for better positions, but they never discussed them with her. "It was never spoken about. It was the survival of the fittest. Fighting for sales, fighting for the customers, favoritism with the manager," said Espinal. Both blacks and Latinos are overrepresented in low-paying cashier positions and underrepresented in supervisory positions. Workers often see favoritism in the workplace. Some of it is likely subconscious. "Managers hire people who look like them or someone they know already. They'll promote them. 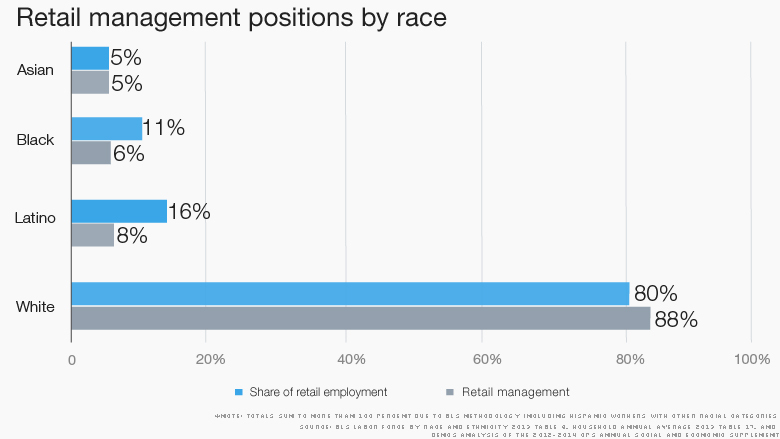 Those managers more often than not tend to be white," said Phil Andrews, director of the Retail Action Project (RAP) and the Retail, Wholesale and Department Store Union. He works with many minority workers in New York City. 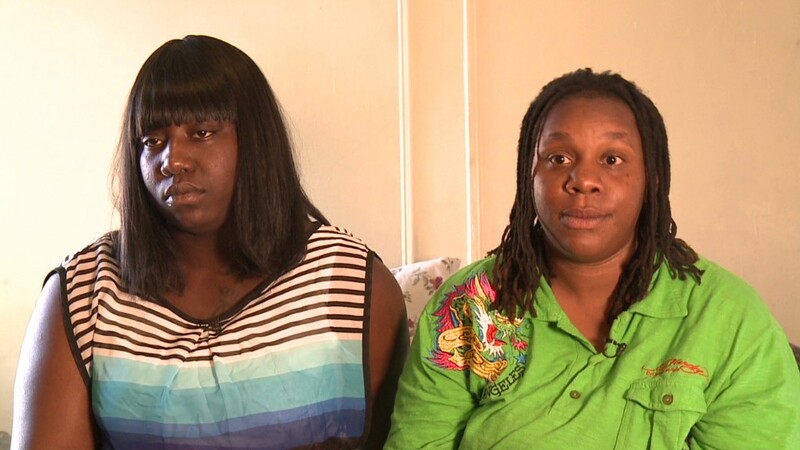 "It's like a falling domino effect: Is it racial? Is it me? Is it the way I look? You just start to question everything," said Espinal. A credit history problem: Another factor that is disproportionately hurting minorities is credit history checks during the hiring process. Credit reports weren't meant for job screening, but more companies are doing them. It sounds race neutral, but it isn't. "Blacks and Latinos are more likely to have blemishes on credit history," says Catherine Reutschlin, policy analyst at Demos and co-author of the study. Reutschlin adds that there is no evidence of credit history and on the job performance being related. Several states -- Nevada, California and more recently, New York -- have now banned employers from doing credit checks as a qualification to get employed. Nature of the business? With so many people looking for work in recent years, companies often get away with treating their employees worse with little consequence, according to retail worker Ryan Montgomery from Pensacola, Florida. He says things have worsened for everyone after the 2008 meltdown. "My former company internally uses clever mottos like 'hire slow, fire fast,' 'comply or goodbye,' 'you got time to lean, you got time to clean.' I leave it to you to figure out how appreciated workers feel after hearing things like that," Montgomery, who is white, wrote in an email to CNNMoney.